Avogadro's number is so large it is only effective for counting the number of atoms, molecules, or ions in a substance. If a glass of water contained 6.0220×1023 molecules of water, you could say the glass contained Avogadro's number of water molecules. It is also acceptable, because of the relationship above, to say the glass contains 1 mole of water molecules. Referring to numbers of particles in terms of moles is commonplace. This is easier than saying "Avogadro's number" or writing out the exact number (since it will be very long). It is also more convenient to speak in terms of moles since it is highly unlikely a substance will contain Avogadro's number of particles or an exact multiple of that number. This is comparable to speaking of eggs or doughnuts in terms of the dozen. Rather than a chef saying he used 42 eggs this morning, he may say that he used 3.5 dozen eggs. Both of those numbers (42 and 3.5) are small enough for the brain to put into context easily, so there is no significant difference as to which one is used. However, it would be markedly different for the human brain to hear that a glass contains 1.204×1024 molecules of water rather than 2 moles of water. 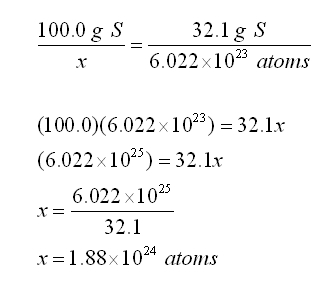 When a chemical reaction takes place, the reactants combine in very specific ratios that are determined when a reaction equation is balanced. It would be wasteful to mix random amounts of reactants with each when attempting to create a desired product. It is important to determine how many particles of each reactant should be used before the reaction is started. This quickly introduces the problem of how to count the number of particles needed for each reactant. Counting particles directly is impossible for two reasons. First, molecules and atoms are not tangible objects and are too small to be seen with a microscope anyway. Secondly, the number of particles needed to accumulate any amount that could be massed would be such a large number no human could possibly count a fraction of that number in a lifetime. Fortunately, the periodic table allows us to accurately determine the number of particles in a substance by taking its mass. Sometimes an unknown compound can be analyzed and its percent composition by mass can be determined. This is extremely useful information since it can b used to determine the formula of the compound. However, care must be taken to differentiate between the empirical and molecular formula. People are most familiar with the molecular formula, as it gives the exact number of atoms of each element per molecule. Molecular formulas are what are used to write reaction equations that you see on every page on this site. 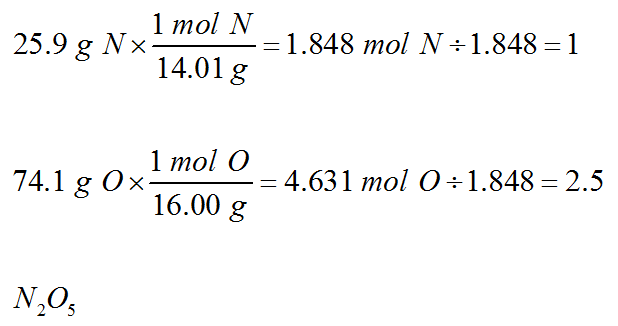 The empirical formula is different. It is the smallest whole number ratio of elements in a formula. For many compounds the empirical and molecular formula are the same, as is the case for water - H2O. The ratio of two hydrogens to one oxygen is not only the smallest whole number ratio of elements in the compound but it is actually the number of atoms of each element per molecule. For many organic compounds, there is a difference. Benzene, with its molecular formula C6H6, has an empirical formula of CH. 3. Divide each molar quantity by the smallest quantity of moles present. Hopefully, this will give an integer ratio of elements to one another. A compound containing only nitrogen and oxygen is found to contain 25.9% nitrogen by mass. Find the empirical formula of the compound.